Drunk driving may be a common offense, but a conviction still comes with harsh consequences. In addition to fines and a license suspension, a DWI can result in jail time and other restricted freedoms. Even if this is your first offense, it is critical that you consult a DWI attorney. According to the New York Department of Motor Vehicles, a first conviction can cost up to $1,000 in fines. You may also have to spend up to one year behind bars. Fortunately, there may be a defense that works in your favor – even if you failed the breathalyzer test. It is possible that the device was incorrectly calibrated or that it malfunctioned. Alternatively, the officer may not have administered the test properly, or a consumer product may have influenced the results. If you are facing DWI charges, contact Goldberg & Allen, LLP. A New York City DWI attorney can investigate your arrest and structure your defense. Jay K. Goldberg and Gerald Allen have both reached the level of First Deputy Bureau Chief in Kings County. Call 212-766-3366 to schedule a consultation. You can also learn more about DWI charges in New York by visiting dui-lawyers.usattorneys.com/new-york. The accuracy of a breathalyzer relies on proper calibration, according to BACtrack. Long periods of inactivity can dry out the device’s sensor, so the results will likely be inaccurate. If there is no record of calibrating the device or performing regular and careful maintenance on it, then your DWI lawyer may be able to challenge the results successfully. Breathalyzers are complicated devices. A small defect can render the results inaccurate. Your DWI attorney can request an evaluation of the device to investigate a possible malfunction. Officers undergo comprehensive training to teach them how to use breathalyzer machines. If they administer the test incorrectly, then the results may be inaccurate. If the officer was not qualified to administer the test, or if your DWI attorney can prove that he or she made a mistake, then the results may not be admissible in court. Some consumables can increase BAC readings. Mouthwash, for example, contains enough alcohol to inflate the results. It may be possible to prove that a consumer product could have affected the breathalyzer reading. Facing DWI charges in New York can feel hopeless – especially if you failed the breathalyzer. This, however, should not dissuade you from fighting the charges. 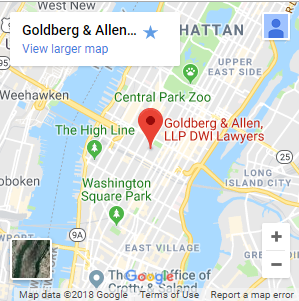 A New York City DWI lawyer from Goldberg & Allen, LLP can evaluate your arrest, structure your defense and aggressively defend your interests. Both Mr. Goldberg and Mr. Allen have experience as prosecutors, giving them a unique skillset for defending their clients against criminal charges. If you are facing DWI charges, or if you were the victim of a false arrest, call 212-766-3366 to schedule a consultation.